Truck drivers across Iran are continuing their nationwide strike and marking the 15th consecutive day on Sunday. The truckers’ strike, beginning on September 23rd, has spread to over 310 cities across Iran. Reports indicate Iranian regime authorities have to this day arrested around 250 of the protesting drivers. Despite these repressive measures and other threats, the truck drivers are braving all odds and continuing their strike and protests. The loading station in Ahvaz of Khuzestan Province, in southwest Iran, remain closed, sources say. The Ahvaz Steel Industries warehouse remains full of goods as truckers continue their strike in all of the country’s 31 provinces. Maryam Rajavi, President of the Iranian opposition National Council of Resistance of Iran (NCRI), sent a message hailing the truckers’ nationwide strike and encouraging to continue their protests as their movement enters its third week. A truck driver from Urmia in northwest Iran says the loading station was completely empty without a single driver. Normally, a large number of trucks would be seen taking on new loads. All drivers are on strike, he says, and none are accepting any new loads. Another driver in the New Shapur district of Isfahan, central Iran, says he and all his colleagues are on strike. All the drivers are rallying outside the city loading station. The petrochemical site in the city of Bojnord reports all drivers are strike. In Zanjan, northwest Iran, all the truck drivers are on strike at the local loading station and not showing any signs of backing down. In Aligudarz, western Iran, none of the drivers have accepted a new load and remain fully committed to the nationwide strike. In Mahalat, central Iran, nearly 200 to 300 trucks with their flat-beds are parked as their drivers remain loyal to the nationwide protest movement and strike. Saturday signaled the 14th consecutive day of this strike launched by thousands of truck drivers, protesting low paychecks, skyrocketing prices for spare parts and tires, and authorities refusing to respond to the truckers’ righteous demands. This strike, despite all the obstacles, has been able to continue in the face of numerous threats and plots launched by Iranian regime authorities. The truckers were specifically seen continuing their strike in the cities of Shiraz, Bushehr, Isfahan, Assad Abad, Borujen, Kashan, Khorramabad, Tehran, Bandar Abbas, Malayer, Saveh, Yazd, Mobarakeh, Fouladshahr, Zanjan and Hamedan. 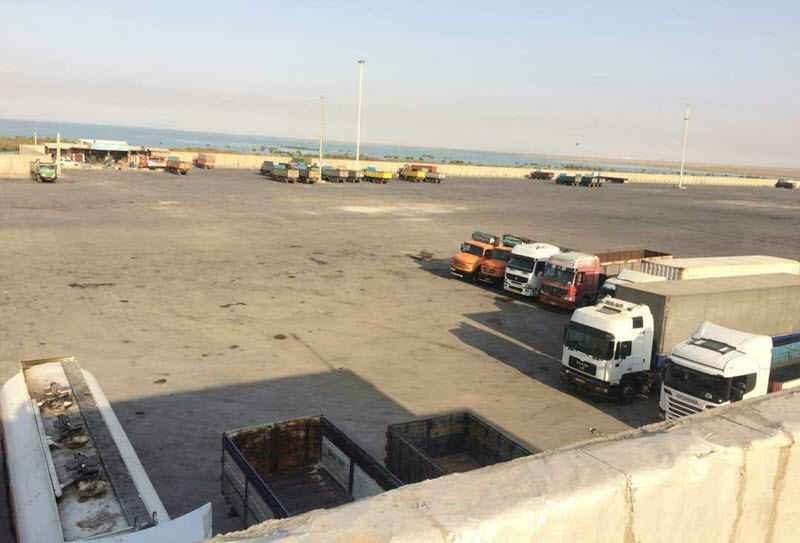 In Bushsher, southern Iran, the unloading process for ships has been disrupted severely due to the truckers’ ongoing strike. The Iranian truckers’ nationwide strike has gained media coverage in the United States, Canada, Australia and a variety of Arabic outlets. A female driver has joined the truckers’ strike and sent a message calling on all her colleagues to continue their protests until their demands are fully met. In Najaf Abad of Isfahan Province in central Iran the protesting truck drivers intended to form a column in a show of their strong will to continue this strike. Local police, however, blocked their path and prevented any such measures. In Ahvaz, industrial steel warehouses are full and no truck are available to transfer them to their end locations. On Friday, authorities dispatched 20 plainclothes agents to a loading station in Bandar Abbas, southern Iran, to claim truck drivers have ended their strike. However, the protesting truck drivers quickly foiled this plot by taking their own footage of the same loading station to show the site being empty and prove that the truckers are continuing their strike. Despite all the pressures and threats resorted to by Iranian regime authorities, the strike has currently spread to more than 310 cities in all of Iran’s 31 provinces. For two weeks now truck drivers in over 300 cities across Iran have been continuing their nationwide protests. Strikes, protests and the all-out uprising in Iran has transformed into an ongoing movement, placing its impacts on the country’s political spectrum on a daily basis. During the past few days, despite threats and other measures resorted to by the authorities, and despite the fact that over 170 protesting drivers have been arrested, in addition to all the difficulties for those bravely joining this strike, the courageous truck drivers of Iran are continuing their protest movement, showing no sign of succumbing to the regime’s demands. This strike, following the major Dec/Jan uprising across the country, and the major protests witnessed in August, is the third round of a nationwide movement engulfing the entire country in the past eight months alone. It is worth noting that workers, teachers and other employees of various branches of Iran’s society are legally forbidden to establish their own independent syndicates or unions. Despite this important shortage, we continue to witness the truckers launch yet another round of nationwide protests in the past five months, protesting the plundering witnessed by the regime’s authorities. Iranian regime officials are seen resorting to threats, intimidation and crackdown, in their attempt to canvas this issue as a security matter that shakes the regime’s pillars and demands drastic measures by the authorities to put down this movement. Col. Kavous Mohammadi, a police deputy of Fars Province in south-central Iran, described the protesting drivers on strike as “disruptors” of order. In a TV interview aired on September 29th, he went on to say 22 drivers were arrested for disrupting order and security in the country’s roads. Head of the so-called judiciary in Fars Province has accused the protesting truckers of “corruption on Earth,” a vaguely worded accusation that can be interpreted to pursue the regime’s interests. Again, these measures have failed to cause any fear among the courageous truck drivers. The truck drivers’ strike has gained the support of international bodies, including the International Transportation Workers Federation. This entity has voiced extreme concerns over the arrest of the protesting drivers. ITF specifically announces its solidarity and stands alongside Iran’s drivers in their struggle to realize their rights. Protests and strikes by people from all walks of life has transformed into a political-economic crisis directly targeting Iranian regime Supreme Leader Ali Khamenei. The truckers’ continuing strike enjoys the support of farmers, teachers, and college students. Many people across Iran feel sympathy with the truckers, understanding the pains they’re going through. Poverty has spread throughout the society at such a rate that people literally feel they have nothing to lose. The ruling regime can no longer provide for the public’s needs and cannot take any steps forwards. As a result, the regime’s resorting to threats, intimidation, arrests and even possible executions will no longer downgrade the protests seen launched by truck drivers today and people from all walks of life throughout Iran. Iran, Oct. 1, 2018 – The truck drivers’ nationwide strike in Iran entered its 9th consecutive day on Monday, spreading to new cities and the four corners of the country. Despite the fact that Iranian regime authorities arrested over 120 of the protesting drivers, parallel to the mullahs’ judiciary authorities and the Revolutionary Guards (IRGC) resorting to voicing verbal threats, the drivers are courageously continuing their strike and paying no attention to the regime’s threatening measures. The nationwide strike of the truckers, entering its second week, is intensifying the crisis inside the clerical regime whose leaders are increasingly horrified from its continuation and spread. In this regard, Iranian regime attorney general Mohammad Jafar Montazeri is now threatening to execute the strikers. “According to the information we have, in some routes, some of the cities, there are elements who are provoking some of the truckers, or possibly blocking them and creating problems for them. They are subject to the rules and regulations of banditry and the punishment of the bandits according to the law is very severe, sometimes resulting in the death penalty,” he said on September 29th as cited by Iranian regime state media. At the same time, Ali al-Qasimehr, the chief justice of the Fars Province, accused the strikers of “corruption on earth,” and IRGC Brigadier General Mohammad Sharafi, one of the commanders of State Security Forces, threatened the protesters with harsh action. However, two days earlier, the Fars Province Transportation Director General had called the strike of truck drivers as rumors. “It’s been a few days that rumors about truck drivers’ strike have been circulating in the media and cyberspace. This misuse of the opponents from the needs of the truck drivers to create crisis in the country is clear for every Iranian,” he sais, as reported by the IRGC-affiliated Fars news agency. “Following the disrupting acts of some of these people on the roads of Fars … After the visible and invisible patrol of officers, 22 thugs and disrupters of public order on the roads were arrested and, after filing a case, they were sent to the judiciary authorities and through them to the prisons. Police will deal with sensitivity and vigilance with the smallest insecurity factors in coordination with the judiciary, and the process of confronting with the disrupters of order and security of the roads and axes of Fars province will continue on a daily basis. The police monitor and control all the roads in this province, visibly and invisibly, and resolutely deal with all elements of disrupters of order and security in these areas,” he explained to the regime’s official IRNA news agency. Mrs. Maryam Rajavi, President-elect of the Iranian Resistance, saluted the strikers throughout Iran, describing the vindictive threats of the clerics against the dignified and hardworking drivers as a reflection of the growing crisis of the clerical regime, and said that the ruling mullahs were the biggest thieves in the history of Iran, and that they neither want nor can respond to legitimate demands of striking drivers. She called on all human rights organizations to take action to release the arrested and urged the general public, especially the youth, to support the strikers. She added that realization of these demands is only possible with the establishment of democracy and people’s sovereignty. A regime that threatens to execute its working people due to a strike must be rejected by the international community. Strikes and protests across Iran are heading towards a final and determining end that is very near in sight. Launching their third round of strikes, truck drivers across the country are demanding what is rightfully theirs. Iran, Sep. 3, 2018 – Truck drivers across various cities throughout Iran are on strike, protesting low wages and skyrocketing prices of spare parts. This is yet another round of such protests in Iran and has always delivered crushing blows to the mullahs’ apparatus. On Saturday, intelligence operatives were reported to have threatened the truck drivers, saying they have no right to even leave their own houses. Intelligence and plainclothes agents were enforcing enormous pressure on truck drivers at the city’s loading station, threatening them in their attempt to prevent another strike by the drivers. Truck drivers in the city of Shapour near Isfahan went on strike on Sunday and held a rally after parking all their vehicles. These drivers are protesting low wages and increasingly expensive spare parts. On Saturday, drivers from a variety of cities across Iran were seen protesting and staging a coordinated strike. Truck drivers in Tehran’s Nasim loading station, and in the cities of Gorgan and Mehran, all also launched their strike. These drivers were protesting and on strike in response to a call placed by the Drivers’ Coordinating Union. In Tehran, drivers parked their vehicles and refused to accept any new loads. In Gorgan, the drivers blocked a highway with their vehicles and held a protest rally. Transit drivers in Mehran, a city in southwest Iran bordering Iraq, refused to transfer their loads to Iraqi drivers and held a protest rally in a local loading station. Truck drivers in the western city of Sarpol Zahab went on strike and parked their vehicles, protesting low wages and regime officials’ refusal to provide solutions to their issues. Reports from the city of Sarakhs in northeast Iran indicate the loading station is closed and transit drivers were on strike. This strike is in response to officials’ refusal to address the truck drivers’ demands and their problems remaining unresolved. Following the truck drivers’ strike and a severe shortage of fuel in various parts of Sistan &Baluchistan Province in southeast Iran, on Saturday vehicles were seen forming long ques at gas stations in the city of Saravan. This shows the powerful impact of truck drivers’ strike on the mullahs’ regime. The strike of truck drivers in different cities of the country continued for the third consecutive day on Wednesday, July 25. On the third day, drivers of trucks and heavy vehicles continued their strike in several cities including Tehran, Mashhad, Isfahan, Shiraz, Kermanshah, Kerman, Zanjan, Urmia, Abadan, Ahwaz, Karaj, Arak, Shahrood, Qazvin, Hamedan, Malayer, Khorramabad, Naghadeh, Najaf Abad , Mobarakeh, Bandar Abbas, Saveh, Khaf, Semnan, Shahrood, Shahrekord, Farrokhshahr, Zahedan, Bojnourd; Yazd; Bandar Khomeini; Khormoussa; Chazabeh; Jajarm; Garmeh; Sabzevar; Shirvan; Kangavar; Darab; Marvdasht; Jahrom; Zarghan; Faroogh; Chalus; Asadabad; Tuyserkan; Andimeshk; Bandar-Mahshahr; and Qom. The mullahs’ regime has resorted to every attempt to break the strike in recent days. In Mashhad, regime’s authorities sold cheap tires at the terminal and advertised it in a bid to deceive the drivers and break their strike. However, the Mashhad terminal was empty and no truck showed up for loading. In Sarbandar (Khuzestan province), regime officials used the trucks belonging to Ministry of Transportation for loading goods to confront the strikers. In Shahrekord too, the regime tried to thwart the strike of truck drivers by using trucks associated with government bodies. In Kermanshah, intelligence agents and the police tried to force the drivers to break their strike by removing the license plates of the trucks of strikers, but they were faced with the protest of strikers’ families. In Bandar Abbas, the regime mobilized a number of moles among the drivers to start loading goods, and desperately tried to show the situation as normal. The regime’s attempt to stop the strike of truck drivers went futile. As the drivers resumed their strike, the head of the regime’s transportation union, Mohammad Khanbalooki, claimed that more than 70 percent of truck drivers’ demands had been met and their major problems had been resolved. He said that all the drivers are aware and know that they should not allow their demands to be used as a means by the enemies of the country…most of those who turned the truck drivers’ gathering into turmoil were from the PMOI who had infiltrated among the drivers…. and all truck drivers have been informed of the PMOI’s attempt for misusing this atmosphere…the routes for the truck drivers in country’s roads are open and 90% of truck drivers have received their bill of loading (state websites – July 23). The Iranian Resistance salutes striking truck drivers, and calls on brave Iranian youths across the country to show their solidarity with them. It also urges the International Labor Organization and other relevant international bodies and trade unions and syndicates of truck drivers in different countries to support the goals of striking drivers in Iran. A new round of strike of truck and heavy vehicles drivers began today, Monday, July 23rd. During the early hours, the strike spread to many provinces of Iran, including Tehran, East Azarbaijan, Kurdistan, Isfahan, Fars, Semnan, Qazvin, Kerman, Kermanshah, Lorestan, Markazi, Khorasan Razavi, Chahar Mahal and Bakhtiari, Khuzestan, and Hormozgan. Two months ago, the nationwide strike of truck drivers that lasted for about two weeks spread to all 31 provinces of the country. They went on strike in protest of the deterioration of their livelihood, low fares, high logistic costs and vehicle installments, and refrained from loading goods and driving. The mullahs’ regime attempted to defeat the strike by repressive or deceptive measures. The arrest of a number of drivers, threats and intimidation of strikers, burning vehicles of the striking truck drivers, using army trucks, and false promises to increase fares were among these measures. The anti-popular policies of the mullahs’ regime that has destroyed the country’s economy impose a double burden on truck and heavy vehicles drivers. In addition to high costs and increasing inflation, these drivers suffer from an increase in extortion by the regime under the excuse of commissions, tolls, etc. The Iranian Resistance salutes the striking drivers, and calls on all brave young people to show solidarity with them. It also calls on the international community, syndicates and unions of truck drivers and workers in various countries of the world to protect these drivers and to condemn the anti-humanitarian policies of the mullahs’ regime.